The large and very stylish looking, 12′ x 8′ Traditional Standard Apex Shed is one of the largest sheds from Treetops Traditional. Offering you all the storage space you could possibly need and perhaps even serving as a very nice area for you to work or just have some fun. This is a shed that has a whole lot of possibilities due to its very generous amount of floor space and impressive height. With a good sized door and six glass windows, the shed has a very pleasant appearance that will ensure it looks good in your garden. This is a shed that is going to be something you can make use of for many years as the materials used are fantastic. The floor is very strong thanks to being made with tongue and groove boards, the roof actually uses these same boards and is then covered with high quality felt. The appealing design comes from the lovely tongue and groove shiplap cladding which protects against bad weather as well as having a smooth and classy type of look. Keeping all of this together is a frame that is one of the strongest on the market as it is thick and has rounded edges. As one of the larger sheds from, Treetops Traditional, the 12′ x 8′ Traditional Standard Apex Shed really is quite the impressive structure. 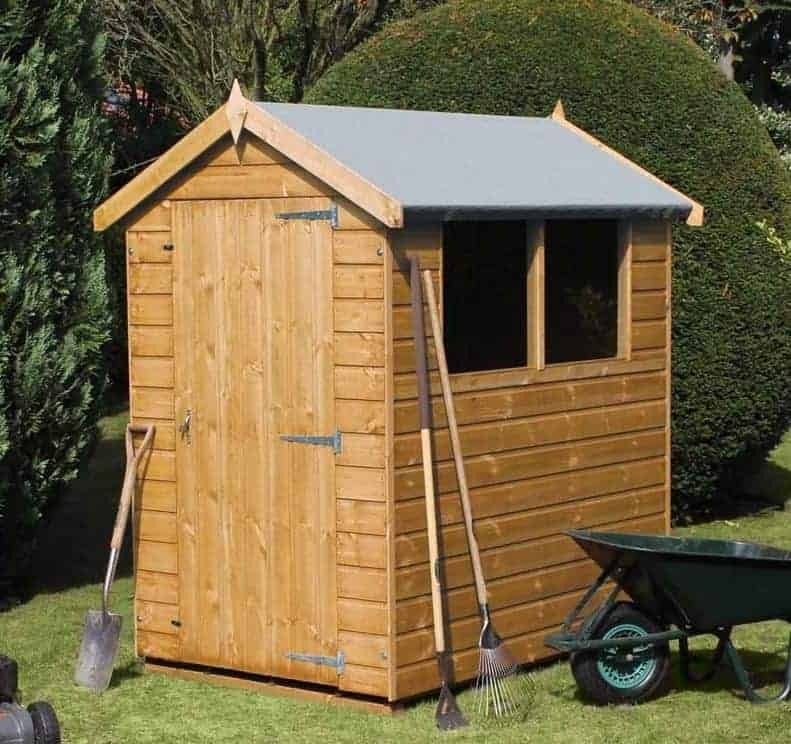 As you can see from the picture this is a shed that has a lot of style and while the actually shed you will be buying is far larger than the one pictured it is made in the exact same way, just bigger. This is one incredibly deep shed at 12 feet and even the width is a good size at 8 feet. Inside the shed we have quite a lot of headroom thanks to the ridge being 7 feet 5 inches high and the eaves, 5 feet 6. The first line of defence against our fantastic British weather is the lovely apex roof that is on this shed. The bones of this roof are made with 12 mm thick, tongue and groove boarding and covered with roofing felt. Your items are very safe underneath this roof as there is no way any rain is getting through it. As you can see in the picture of the smaller version of this shed, the cladding has a very stylish look to it. This is because, Treetops Traditional have used tongue and groove shiplap cladding that is 12 mm thick. We really like this type of cladding as it offers a waterproof seal against the weather and of course it also looks just incredible. While it may not get as much attention as the roof or the cladding, the frame is one of the most impressive aspects of this shed and it will make this a structure that stands firm for a number of year. One of the things that makes the frames Treetops Traditional use unique is that they always have rounded edges. 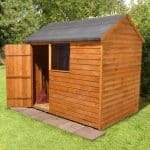 This along with the fact that it is a solid, 44 mm x 27 mm make this one very robust shed. We thought for sure that the flooring would be where Treetops Traditional would try and cut the costs a little bit, but we were very pleasantly surprised to find out that they have used high quality 12 mm thick, tongue and groove boards for the flooring. This gives you a very solid base under your feet that is going to feel solid as you are walking around and also be able to take the weight of any heavy items you may have. As is the case with the other sheds in this line, a free basecoat treatment will be applied to the wood. This is just for short term protection and a generous coating of wood treatment will be required shortly after you have built it and then on a yearly basis. Do this and that wood will stay rot free for the life of the shed. A one year guarantee will look after you in case there is any kind of issue with the materials or rot. We always like to see a large door on a shed of this size and we are very pleased with what is on offer here. This is a single door, but it is 2 feet 6 inches wide and 5 feet 9 inches high which should be more than enough to get even large items in the shed. The door pictured is the one that comes as standard, but you can request this be changed to look like the same kind of door you would find on a stable. Also if you feel that you need more space to get things in and out of the shed then you can pay, £53.99 to get a double door on the shed. The 12′ x 8′ Traditional Standard Apex Shed comes with six, horticultural glass windows. These windows are just like the ones pictured, except there is six of them. These are large windows and if you would like the windows to open then you can add this as an extra for, £31.99 per window. The door has a lock on it so there is no need for you to mess around with latches, pad bolts or padlocks. Once you are done in here, you just use the key and lock it up securely. Of course with there being six windows, you are not getting a whole lot of privacy here. But there is of course ways to get around this like adding in some curtains or even just using a piece of fabric. Or if you want to take things to the extreme then you can have this shed be fully boarded and have no windows at all. One thing that Treetops Traditional do better than anyone else is let you customise the shed. They offer upgrades and customisation options to the door and the windows which is something we really like. Of course as you need to treat the wood there is always option to use a treatment that has a nice colour. 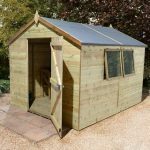 We already talked about the door and the windows, but there is a few other optional extras for this shed that you may be interested in. To start with if you want to make that floor a bit stronger or even if you are worried about the ground you are installing it on then the wooden floor bearers may be of interest to you. At £61.99 these we feel, are quite fairly priced. There is also their installation service available for £109.00 which is handy if your version of DIY usually involves a trip to A&E. We are very impressed with how, Treetops Traditional have managed to make this shed so large, but also keep the quality high and not have to cut any corners. 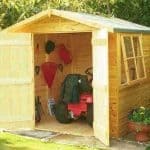 You will need to roll your sleeves up once a year and give it a fresh coating of treatment, but by doing this, you will have a shed that is going to be part of your garden for many years and also look great thanks to the new coat protecting the wood. 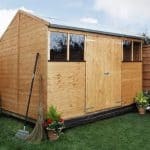 This is one very large shed and offers you just a huge amount of floor space along with generous headroom. As this is on the large side this will take 3-5 hours to build, but as long as you have someone to help, a fresh pot of coffee and the radio on then this can be quite the fun experience. Of course if the thought of building this fills you with terror then there is their installation service for you to consider. The size of this structure along with the high quality materials used makes this something that does offer amazing value for money. We know the price is high, but you are getting a lot for your money with this shed. 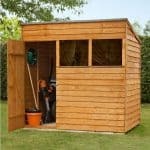 Final Thoughts: Very few sheds manage to offer such a huge amount of storage space and also have such a lovely look as the 12' x 8' Traditional Standard Apex Shed does. We feel that if you do have a big family and require a lot of room then this would be just perfect. Also its large size makes it a structure that would work very well as some kind of workshop. 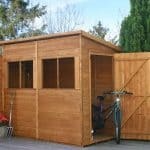 We know that the price is not what most people would call cheap, but when you think about the huge amount of space the shed offers along with the high quality materials then it does make this something which is very easy for us to recommend, especially if lots of space is the main thing you are looking for in a shed.